The escape shuttle that Zod destroyed last issue was a decoy. Lois and Jon are still alive and in the Fortress, but Jon has wandered off. Meanwhile, Superman, New Super-Man, Superwoman, Lex Luthor, Steel, Eradicator, and Cyborg Superman are about to enter the Phantom Zone. Superman feels a weird pain and regains his sight. Without a tangible form, his body was repaired. The Eradicator and Cyborg Superman hide away as they prepare to embark on their mission. The Super Family find and ambush the two, but Eradicator quickly makes an escape. Back in the Fortress, the pecking order is questioned by Metallo and Mongul. They are swiftly dealt with. Before Zod can reveal his plan for Supergirl, he is attacked by the Kryptonian battle suit. Inside the suit is Jon, guided by a mysterious voice. 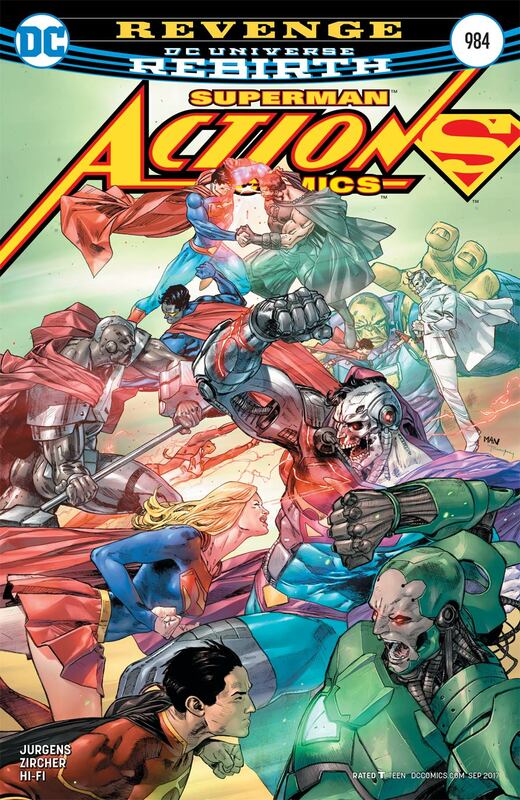 Supergirl joins the fight against Zod while Superman tracks down the Eradicator in the Zone. Before the Man of Steel can finish the fight, he gets hit by a rock thrown by Ursa. With her is Lor-Zod - son of Zod and Ursa. 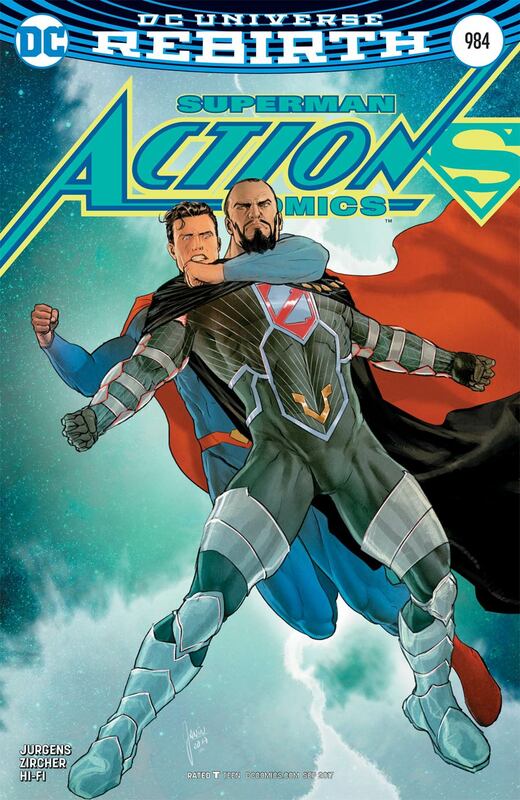 Overloaded by the strain of maintaining a telepathic connection with Eradicator, Blanque is unable to inform Zod that his family has been located. Zod discovers Jon is the one inside the battle suit, but before the Kryptonian general can harm him, Lois commands Krypto to attack. Zod incapacitates Krypto and brings Ursa, Lor-Zod, Superman, and Eradicator back. The Zod family leaves the Fortress. Superman frees the rest of the Super Family, but leaves Cyborg Superman behind. The mystery voice is revealed to be Mr. Oz. Elsewhere, the Zod family plans to conquer an entire planet and build a new Krypton. Story - 5: Wow, what a conclusion! Not only do we get more buildup for the upcoming Mr. Oz story, but we also get the reintroduction of Lor-Zod. I honestly wasn't expecting that, but considering that Jurgens is writing this book, it totally makes sense in hindsight. I appreciated seeing the Super Family work together as a team, especially in the Phantom Zone. I still feel a bit dirty including Luthor under the "Super Family" brand, but it is what it is. I also appreciated Zod backhanding Metallo and punching Mongul into space. I just found it to be funny. I hope we get clarification in future issues regarding Blanque's state. I genuinely couldn't tell if he had passed out as a result of the stress or if he died. It was also nice seeing Krypto take part in the fight. Art - 5: Zircher has been so great on this title. He draws Superman just the way I think he should be drawn. His style really compliments Jurgens' writing. It's like reading a 2.0 version of 90s Superman, and I'm all for that. I especially love how the coloring is a bit desaturated to distinguish the scenes in the Fortress from the scenes in the Zone. If I had to make one complaint, it'd be Lor-Zod's hair. It just screams try-hard hipster to me. Even then, the design doesn't take anything away from the book for me. Cover Art - 4: This is a solid cover. It's well-drawn and really communicates that a battle occurs in the book. I feel it's a bit busy, but not to the point where it's distracting. I also have to give props for including a good portion of the story's main players. Variant Cover Art - 4: Mikel Janín is quickly becoming one of my favorite modern artists. Between the variants he's been doing for Action and the work he's been doing over in the Batman mainline title, he continues to impress me week after week. There's just something graceful about his art. The lines and the colors are so smooth. This issue's variant just screams "Superman II" to me. I'm not much into variant collecting, but Janín's covers could change that real soon.